How To Maximize Your Holiday Campaigns Through Online Surveys? When a holiday season strikes, you get to notice two types of people. The buyers and the seller. Both are downright frenzied to the point to make a difference in the world. How? From the point a marketing campaign is announced, the ready-to-stampede customers line up at the doors of the store while the busy-bee marketers are piling up the shelves with discounted products. There’s probably something that keeps the holiday market on top of the list of every customer. Sure, the brands must have reached their customers through every possible platform. They would’ve run prompt campaigns along with hyped social media postings and would’ve taken every possible step to drag the prospective customers through the line of indecisiveness. But how far are these campaigns successful, given that every campaign is different from the other? Regardless of the business, each marketing campaign should center on the customer, i.e. the customers should be kept in focus and the campaign should be driven via deep customer insights, improved customer experience, better customer service, and pin-pointed customer satisfaction. Did you know that you can maximize the potential of your holiday marketing campaign using customer-oriented surveys? Online surveys are a great way to topple the consumer behavior into smaller fractions that are easy to understand. For instance, it helps you understand all the whats and hows based on the collective shopping pattern. With a survey creator, you can translate the disparity that lies between the theoretical and practical model of a consumer activity. However, if your sales have been going down recently, here’s a promising chance your product can top the shelves of each store every holiday season. Without further ado, let’s begin. Like they say, if you never ask for it, you’re never going to get it. If you want to learn what your customers want from you, you need to keep digging until you hear the ‘ting’. Concentrate on every important aspect and build a customer base, the data of which proves crucial in your holiday marketing campaign. Down below are a few important questions, without which your online campaign is incomplete. P.S. these are the questions that you need to discover yourself. Does your target audience prefer online shopping or the traditional one? What motives your customers to purchase your product? What are the biggest sales opportunities that a business get in the holiday season? In which holiday season are shoppers more likely to spend their budget? How important is it to deliver a strong shopping experience? So, we’ve reached the most important part. As we discussed above, everything about your business revolves around your customer. Which means that your customers and their preferences should become your topmost priority. Following are the top five ways through which you can use a survey maker to create the pumping difference with a holiday twist. Whenever it comes to seasonal holidays, the first thing that comes to mind is the discount tag that comes attached to it. 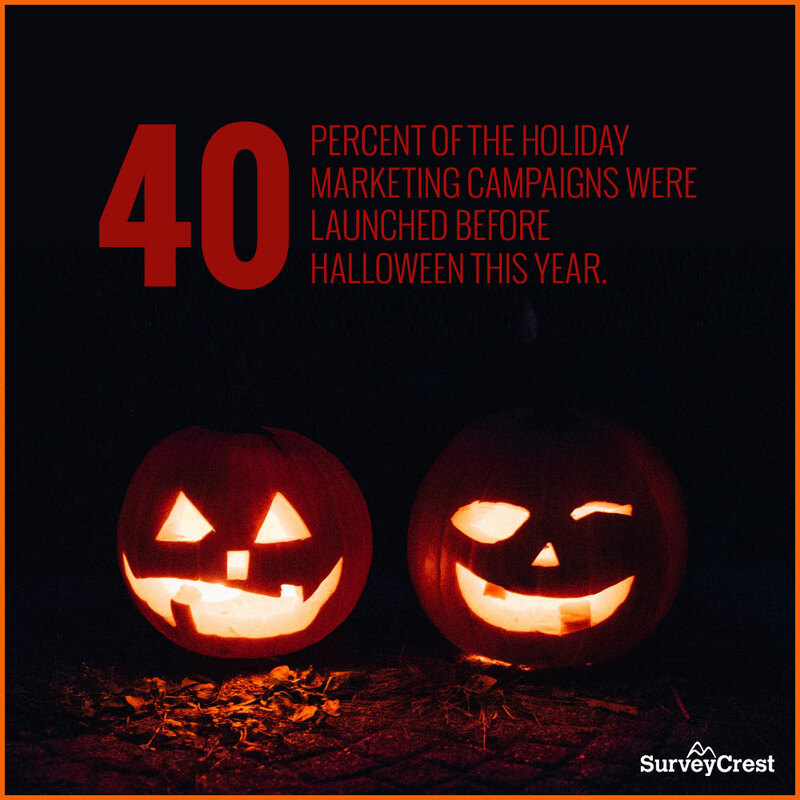 According to Experian, 40% of the holiday marketing campaigns were launched before Halloween this year, which leads us to the fact that many major holidays will fall consequently in the coming part of the year. Whether it’s Black Friday, Cyber Monday, Thanksgiving or Christmas, customers are in for the best bargain and discount. For instance, many brands give 75% off on their selected products, some give discount vouchers with prices off as much as 50%. These discounts and bargains are the driving sales force, you know! As an entrepreneur and a marketer, you’re obliged to stick to this notion and ask your customers about their budget and the discounts they’d like to receive. For example, you can ask the following questions in your survey: Will you buy product X if it goes on a sale of flat 15% off as compared to product Y going on for a sale of 20%? Would you prefer free shipping or a 10% off discount voucher? Either way, you get to hold the attention of your customer. Pro Tip: Research the market to see what our competitors are up to. And that must be done weeks before the actual holiday date. To ease your research process, use a free survey creator because running a campaign and gathering insights isn’t easy, you see! 2. So… What Do You Expect? As much as you’re focused on your customers, they’re focused on their desired product. And most of the marketing campaigns revolve around delivering the products that mostly appeal to the customers more than addressing their needs. 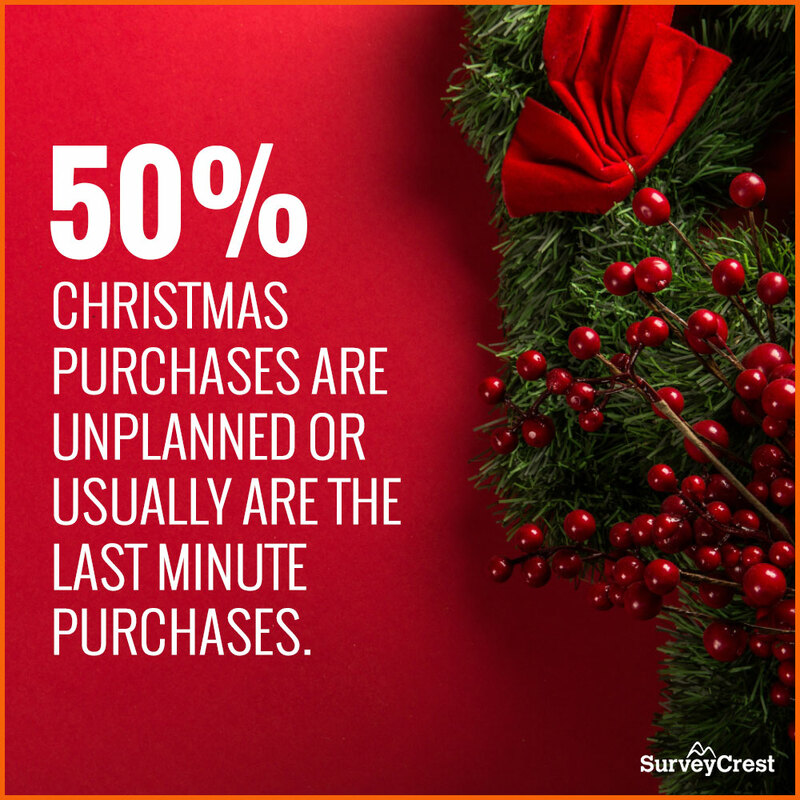 And the reason for this is the recent fact that 50% Christmas purchases are unplanned or usually are the last purchases. To turn the tables in your favor, what you can ask your customers is about how they’d like to rank your product in terms of discounts, promotional bundles, freebies, last-minute shopping deals, and a lot more. You can use the data to shape your product – part based on customer expectation and part on your marketing skills. It’s like killing two birds with one stone! 3. You’re A Seasonal Shopper, Eh? Is your regular shopper keen and excited about spending their budget during the holiday seasons? Worry not, because most shoppers are like this. 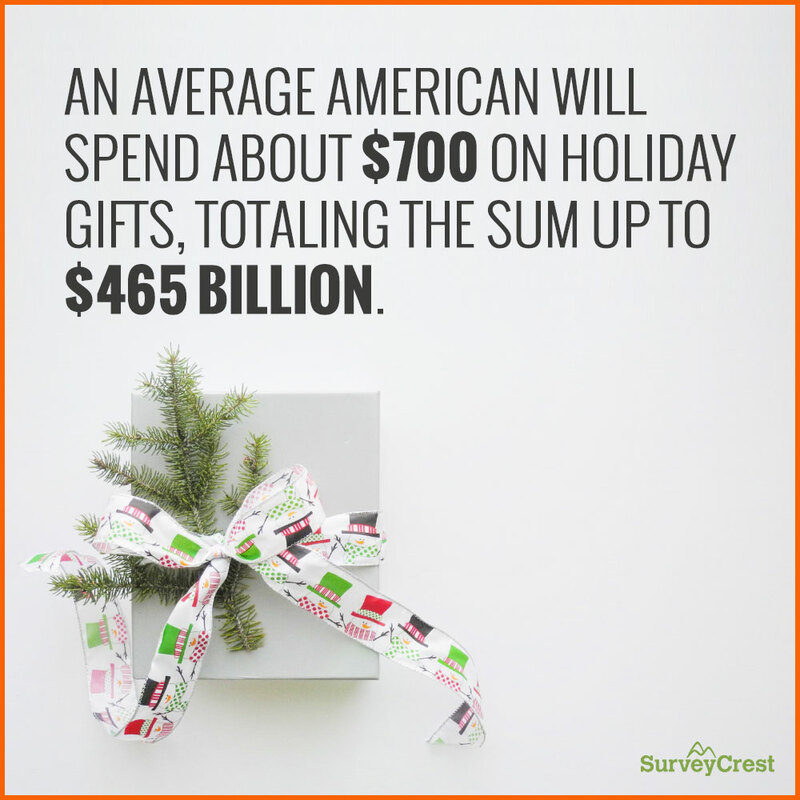 It has been estimated that an average American will spend about $700 on holiday gifts, totaling the sum up to $465 billion. Which means that you’ve got to make sure you let the ‘cat’s meow out before the cat is entirely out of the bag to celebrate the holiday’. Let the word out; spread it as much as you before launching your campaign. Your planning in advance can help you think of all the possible ideas that can help you rev up your sales. Run your survey asking customers about when they like to shop for holidays, do they prefer September, October, November, December or are the last minute shoppers? As a business, questions like these offer you massive insights into whatever you can offer your customers to drive their experience. Also, you might learn in advance about when your customers will be making their move. It leverages you to develop your campaigns and offers as well. If you’re a procrastinator, don’t worry because an online and free survey creator can help you in the nick of time. Pro Tip: Try not to push customers way too far. Committing mistakes in the survey can abhor even your dedicated customers, which might make them abandon the survey and leave your research incomplete. 4. Would You Like To Leave Us Some Reviews? A question like that in the header above can be closed or open-ended, so to add flexibility to how your customers would want to review your product and service. For instance, if your customers come across your website and spend some time shopping, you might ask them if they enjoyed the experience. On some account, these customer reviews play a key role in reviving your sales. Think for yourself: If the customers leave positive reviews, there’s a greater chance that others will find that helpful when contacting your services or buying your product. You can take your cue on how websites like Yelp and such help turn visitors into loyal brand ambassadors. In case you didn’t notice, an online survey maker will help you organize the questions in such a way that your customers will be bound to leave the reviews that are going to be your sales generator! However, the survey questions might follow like: On a scale of 0 to 10, how would you rate our services? How have you found your holiday shopping experience with us? How would you like us to improve? If you make changes analyzing all the other shopping behaviors, then you’re bound to land yourself some positive and formidable ‘word of the customer’. Nothing matters more than you constructing your survey for the intended audience. And as you know, it all lies in the details. These are your assets to pinpoint your customer focus. Apart from personal details, you can ask questions relating to their shopping details, like their budget, their preferences, their holiday interests and hobbies, and the list goes on and on. As mentioned before, these details not only let you improve your services, but also let you build a stronger and focused customer base. The more the data, the more are the chances for you to take the lead during the holiday season. Take it from us, an online survey creator can help you save the trouble of adding redundant questions and help you create a survey like a pro. Regardless of the business you run, conducting an online survey helps you dig deeper into knowing what your customers want and how they want it. And since it’s the holiday season, your targets are going to expect something out-of-the-box from you, which is why you need to stay updated on how you’re going to cater to your customers. If you still find it hard to construct a survey on your own, you can approach a free survey maker! If you plan beforehand, the upcoming holidays are going to make your insights turn into a real-time success this holiday season. It’s time your customers be blessed with the ultimate holiday shopping spirit. It’s worth their while, don’t you think?